Two weeks ago, the authors at Engineer Blogs opined about their favourite engineering classes. This week, it’s all about their worst. For me, there are many classes that come to mind where the professor would have been well-advised to attend a remedial teaching course. There was that 2nd year circuits course, where the frequency response of a circuit network was represented using the Laplace s-domain. The problem was that nobody in the class knew had ever seen the s-domain and the professor insisted on not teaching the math to us. A fifth of our class got weeded out by this course. Then there was the 3rd year statistics class, where I’m pretty sure I failed the final exam, but still ended up with 99% on my transcript due to the bell curve. Asking students to write the proof to an obscure, never-taught theorem on the final and making it worth 1/4 of the exam is cruel indeed. Or that 1st year class on digital computation, where we were supposed to be taught the foundations of software programming. Instead, the newly minted Ph.D. and associate professor thought that it would be fun to write down, without explanation, a bunch of gobbledygook on set theory and the computational costs of various software algorithms. I couldn’t even understand half the questions on the midterm exam and the final wasn’t any better. Still, none of these matched the utter disappointment and bewilderment I felt in taking a 3rd year class titled Transmission Lines and Basic Field Theory. It was a course in waveguides, mm-wave, antennas, striplines, microstrips — stuff one typically uses when designing high frequency circuit boards. In an early Engineer Blogs post, I wrote about the Smith chart, a basic tool for those working with transmission lines. In a prior reincarnation, I also used to work in the niche market of RF ICs (GHz wireless chips). So it would appear on the surface that this course is what gave me the foundations to pursue RF circuit design later in life. Alas, that couldn’t be further from the truth. I wrote glowingly about my electricity and magnetism class on Engineer Blogs a couple of weeks ago. Based on that experience, I thought that this class would allow me to broaden my E&M horizons. It started out quite well. The professor, close to retiring age, handed out hand-written course notes for the entire semester. He seemed like an approachable, affable fellow. Unfortunately, those first 10 minutes would prove to be the best as it was all downhill from there. From the very first lecture to the very last, I cannot recall a single thing that I understood that came out of his mouth or from his notes. I remember him teaching us about Smith charts, but I didn’t understand it at all. I also remember him mumbling something about 1/4 wavelength, but hell if I knew what he meant. 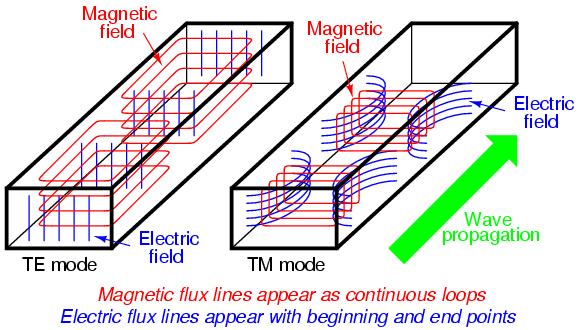 Then there were those circling magnetic flux lines inside a waveguide (see above) … whatever. His teaching was so far removed from our comprehension that we didn’t even know what questions to ask. Perhaps there really was only one question that was applicable — what the #$%^& are you talking about?! What’s ironic about all of this is that the class average ended up being 81%, yet nobody that I talked to understood anything about this class. The professor told us that the exams would be based on the homework, which he had provided answers to. So for those that were good in recognize buzzwords from the exam question and matching it to the homework, they ended up with a decent mark as both the midterm and the final became an exercise in plugging in numbers into a formula. Never mind why that formula was used. Never mind what that formula actually means. By the time the final exam rolled around, no one cared anymore. We just wanted this nightmare to be over. This sounds so much like my transmission lines class that I wonder if we were taught by the same professor. I didn’t get much out of my E&M class. I should go back and take another one b/c I think I would appreciate it more now coming at it from the intuition and rules of thumb I’ve developed. At the time I took the class, I was coming at it as one application of stuff from physics class. It would do mean good to revisit E&M including the hard-core physics now that I have an intuition about it.